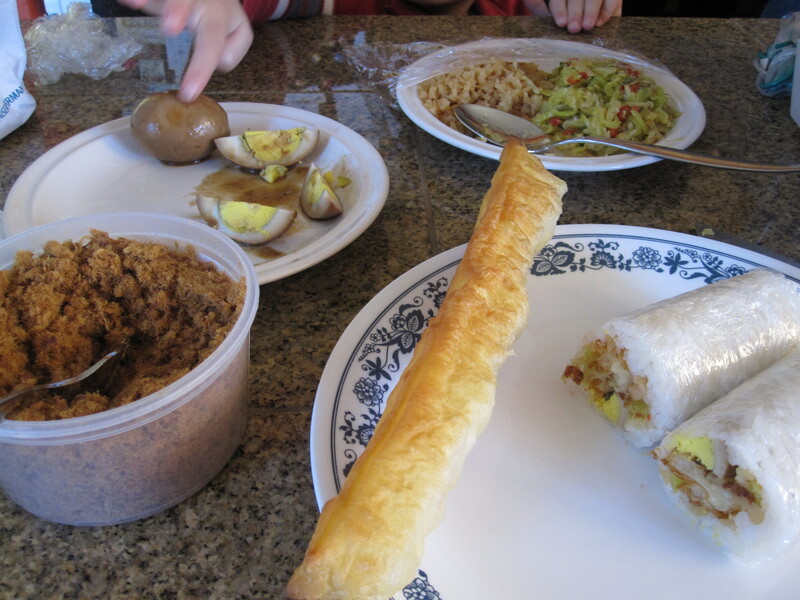 The first time I had gluten rice rolls was when Richard and I visited Taiwan 8-9 years ago. Back then we didn’t eat the rolls fresh hot (we were busy eating many other local snacks!) and saved it later when we boarded the plane back home… Even it was cold but it was still very delicious. This is the second time I made sticky rice rolls at home. Unlike the first time, I used half sushi rice and half gluten rice, so that it is easier to digest for my stomach. 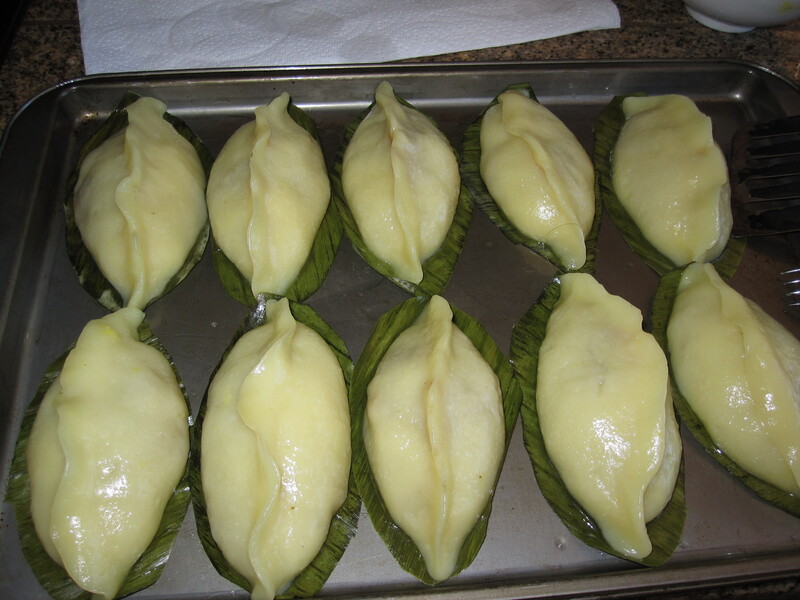 The fillings is very versatile, but typically includes eggs, pork floss, fried Chinese donuts, saute preserved turnips, saute preserved mustard green etc… I prepared the fillings ingredients while the rice was cooking so everything was ready to be wrapped when the rice is cooked. The rolls are individually plastic wrapped thus making it very convenient to eat during a road trip, just keep the rolls in a thermos to keep warm. Oh, these rolls are very fulfilling as well. 1 Fried Chinese donuts– see note below. 3 stewed eggs– see note below. Combine glutinous rice and sushi rice in a bowl, wash and rinse 2-3 times. Cook the rices in the rice cooker (follow rice cooker instructions for gluten rice). Pull Chinese donuts apart into 2 sticks, cut each stick into 3 portions and then cut in half lengthwise for each portion. Toast in oven to make them crispy. Set aside. Slice the stewed eggs into small wedges– 1 eggs into 6 wedges. Stir the rice to loose up when it is cooked. Divide into 6 portions. Scoop 1 portion of rice and spread it on a piece of plastic wrap. Arrange the fillings (3 egg wedges, 2 donuts sticks, 1 heap tbsp each of saute turnip and spicy mustard green, sprinkle of pork floss) in the middle of the rice and roll it up tight like a sushi roll and wrap with the plastic wrap. Serve hot. Chinese donuts– fresh donuts are available in certain Chinese restaurants serving breakfast. Frozen packaged ones can be found in Chinese grocery stores in frozen food section. I happen to have stewed egg leftovers. 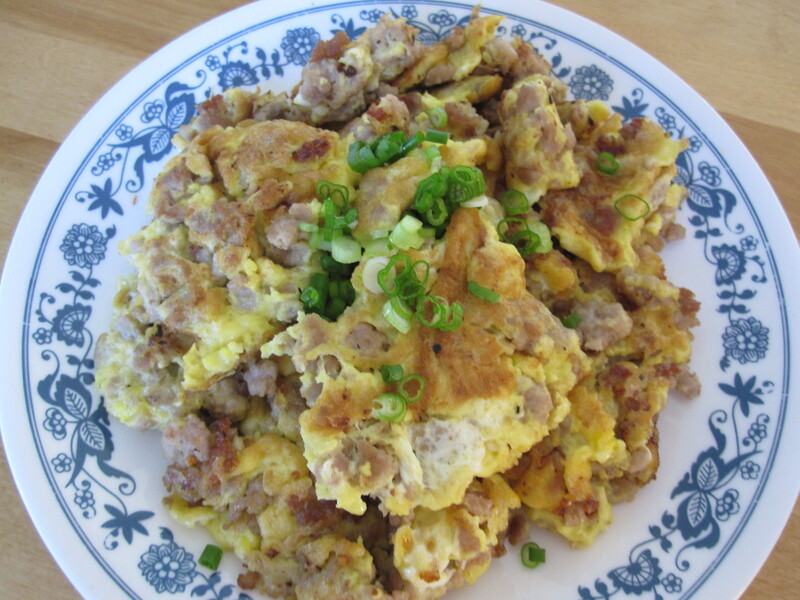 If you don’t have stewed eggs, you can substitute with 3 thin egg omelet then cut into strips. Method: Saute garlic until aromatic, add turnip, salt and sugar and saute until the flavor of turnip comes out. Dish out. Method: squeeze wash and rinse julienne mustard green in a bowl 2 times then squeeze dry. Saute garlic and peppers until aromatic, add mustard green and saute for a few more times. If it tastes a little bland add just a little of salt. Dish out. 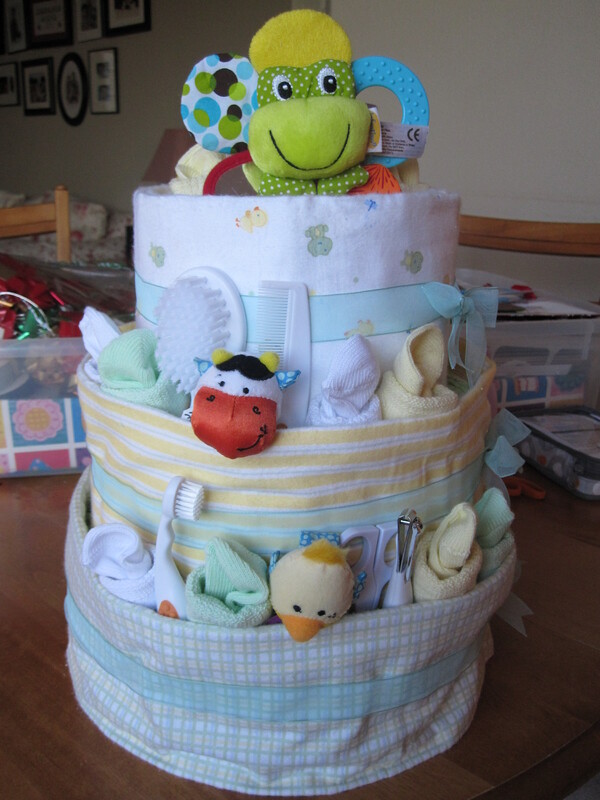 My first diaper cake attempt… looks pretty good huh?! It’s very fun to make and takes so much less time than making a traditional cake. The cake toppings can be any thing you want depending on your budget, the deco theme etc. I do take orders so let me know if you are interested. This past Sunday I was in the kitchen the whole day baking 3 Tart Tatin’s and 3 Banana Chiffon Cakes, to give them to my friends and neighbors as a holiday treat. Thank you very much for all your help when I needed– Auntie Wang, Amy, Angela, Mrs. Kang, Lily, Nancy Wong, Romero family, and Andy & Nancy. You all are very nice people and I’m blessed to have you as my friends and neighbors! 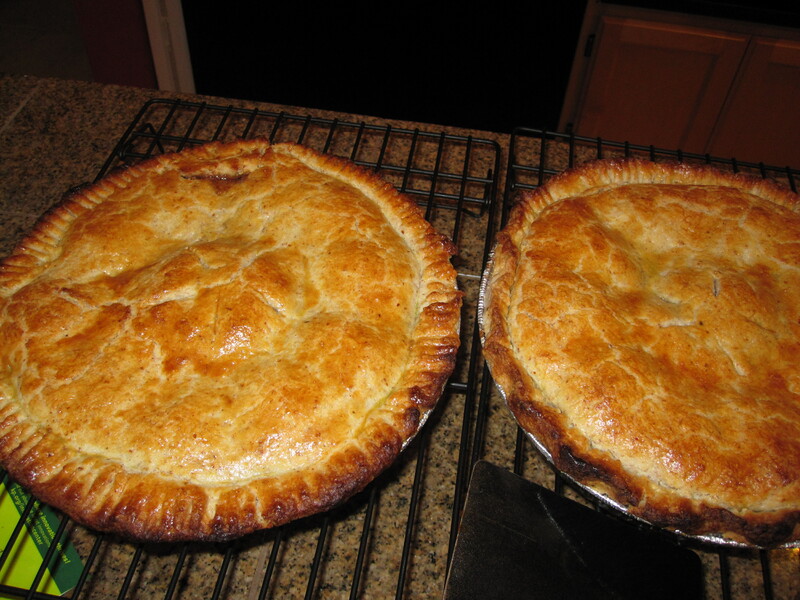 Tart Tatin-- I wanted to wrap them up nicely like banana chiffon cake but wasn't able to do it as it was already delivery time and the pies were still very warm. 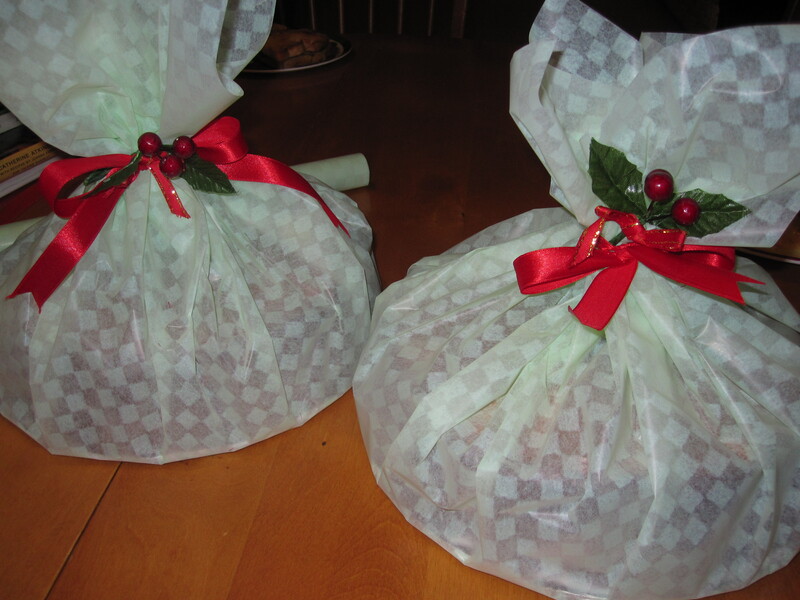 Banana Chiffon Cakes in Christmas gift packaging. In the mixing bowl mix well the first 7 ingredients then add in egg. With dough hook attached and starts kneading, slowing add water to form a dough. Drop in butter and continue to knead the dough until it doesn’t stick to the bowl and pass the “membrane” test. Lightly knead the dough a few times to punch out big air pockets trapped inside. Divide into 3 equal portions. (If you’re not using optional stuff listed on the top, divide the dough into 9 equal small rolls and rest them in a greased square pan for 45 minutes before baking). Take 1 portion and roll it out, sprinkle some green onions, ground black pepper and salt on top. Roll the dough up like a swiss roll. Pinch to seal the edge. Then cut into 3 equal small rolls, with cut side facing up and put on a square baking pan. Repeat this step with the other 2 portions. 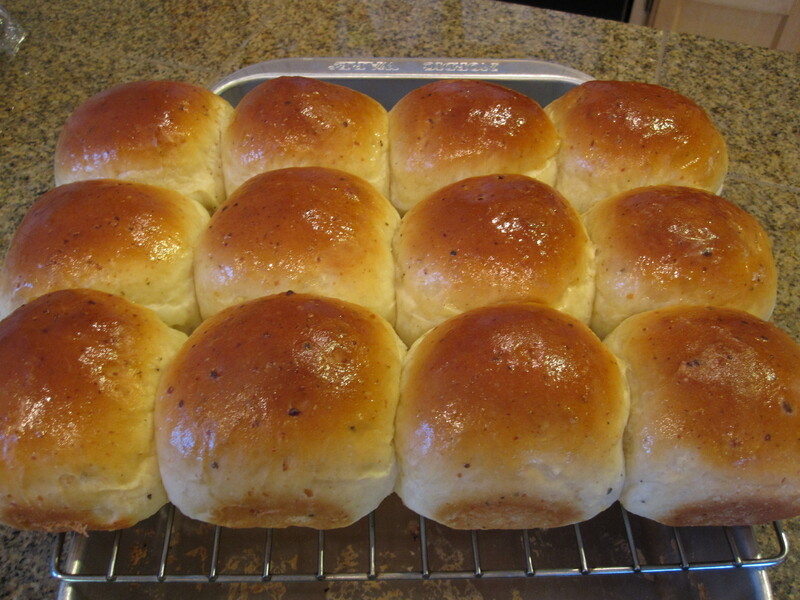 Leave a little space among the rolls as they will expand during 2nd proofing and baking. Cover the rolls and proof again for 45 minutes (again, I used moist hot towels underneath the pan to speed up proofing time). Sprinkle some cheese on the top and baked in preheated 350°F oven for 20-25 minutes, turning half way until golden brown. Brush top with melted butter and serve hot.